"The list is the result of well over three years research and was begun solely because no record of the names of those involved in the action existed. Somewhere in the region of five hundred letters were sent to newspapers here in the UK, then Canada, Australia, New Zealand and South Africa. The ensuing response was very good; contact was made with at least ninety Commandos as well as next of kin of those who are no longer with us. Each contributed with names of those they could recall as having been with No 4 Commando at Varengeville. A number of names of those involved were already documented, the remainder, some two hundred names are the product of a consensus of opinion among the Commandos who were contacted. However, I wish to point out that opinions were not always unanimous; this was, quite naturally, to be expected but eventually sheer volume of opinion allied to personal memories persuaded me that the names submitted were clearly the names of those who were involved in Operation Cauldron. 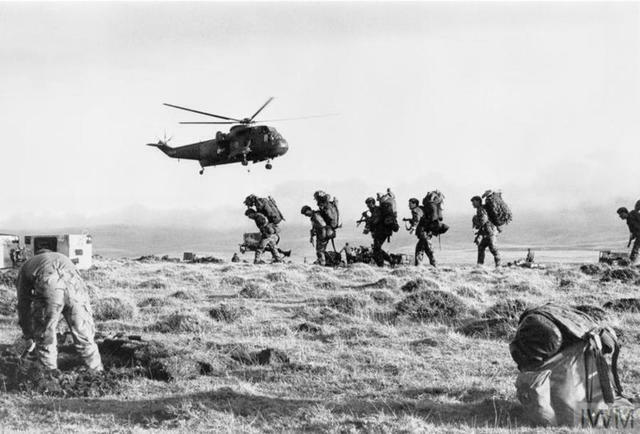 The men of No 4 Commando were asked to delve deeply into their memories and recall an event that occurred forty eight years ago, this could not have been easy, their response was excellent and the rapport and teamwork which quickly materialised between us had to be experienced to be understood. Men whom I had never met became companions in the task, their constant message of advice and encouragements became the spur which enabled me to continue with what, at time was a frustrating task. I can but once again thank each and every one of these Commandos for their inestimable assistance. At the risk of being considered invidious I must mention the name of one person without whose help this list could not have been completed with accuracy and attention to detail such as numbers and regiments Etc. The General Secretary of the Commando Association Mr Ron Youngman proved to be a tower of strength, his patience and goodwill in the face of my interminable enquiries was exemplary. Finally, I accept full responsibility for any errors but as Queen Victoria once remarked "History is not what actually happened but what you believe happened?" Thus, I believe that within these pages are the names of all the men who fought and died at Varengeville. Rhosllanerchrugog, Nr Wrexham, Clwyd. July 1990. " OC : Lt. Col.The Lord Lovat MC. 132780 Capt. Dunning-White J. V111Hussars. 130201 Capt. Smith A.D.C. Intel. Corps. 155073 Lieut. Coulson L. Durham L.I. 106677 Lieut. Carr E.L.K.A. R.A.
199623 Lieut. McKay D.B. R.E. 53193 Lieut. Ennis J. R.A.
149347 Lieut. Veasey A.F. Worcesters. nb. All awards shown are those held on August 19th 1942. 5183147 Sgt. Adlam W. Glosters. 6918457 Pte. Allan W. S. Staffs. T/71345 Sgt. Allsop W. R.A.S.C. 7017211 Rfn. Anderson R.J. R.U.R. 3965128 Pte. Andrews V.W. Welch Rgt. 3319294 Pte. Bagdonas E. H.L.I. 3445730 Pte. Banks A. Lancs. Fus. 5345368 Pte. Barnes W. R. Berks. 7662631 Fus. Barnett G. R. Fus. 5382464 Pte. Bateman L. Ox & Bucks. 5389646 Cpl. Batty R. Ox & Bucks. 7901939 Sgt. Bend F. R.A.C. 7013529 Cpl. Birmingham C. R.U.R. 3187064 Pte. Bowskill W. K.O.S.B. 6980161 Fus. Boyd J.M. R. Irish Fus. 5389958 Pte. Bradbury G. Ox & Bucks. 6297735 Pte. Bradshaw S. Buffs. 4206261 Fus. Bramwell T. R.W.F. 5619678 Pte. Brooking A. Glosters. 3134093 Pte. Bryne C.W. Borders. 6292500 Pte. Burnett J. Buffs. 3317331 Pte. Burrell J. H.L.I. 6087599 Fus. Burrows P. R. Fus. 4346042 Pte. Burrows C. East Yorks. 3313393 Pte. Campbell T. H.L.I. 3194284 Pte. Carlin J. K.O.S.B. 53811205 Tsm. Chattaway L. Ox & Bucks. 6850530 L/Cpl. Chitty J. K.R.R.C. 5880377 Pte. Clark M. Buffs. 6028720 Pte. Clement D.R. Suffolks. 5186173 L/Cpl. Cleveley E. Glosters. 206488 Fus. Cook G. R.W.F. 6292556 Pte. Coote A. Buffs. 3248703 Pte. Craig G. Camerons. 4036812 Sgt. Cross E.W. K.S.L.I. 5953035 Pte. Dale J. Beds & Herts. 868384 Gnr. Davies B.K. R.A.
734604 Gdsm. Dennis A. Welsh Guards. 6291999 L/Cpl. Diplock A. Buffs. 4914037 Sgt. Dobbs A. S. Staffs. 4914036 Pte. Dobbs C. S. Staffs. 3962136 Pte. Doubler C.A. Welch Rgt. 364981 Pte. Donkin H. S. Lancs. 6293173 Pte Duhig J. Buffs. 7893672 Tsm. Dunning J. R.A.C. 3673408 Pte. Elliot G. Somerset L.I. 4031772 Sgt. Evans J. K.S.L.I. 889636 Gnr. Evans H. R.A.
5957221 Pte. Farnborough F. Beds & Herts. 7903742 Tpr. Finney W. R.A.C. 3858160 L/Cpl. Fletcher A. Loyals. 5342083 L/Cpl. Flowers D. R. Berks. 3199275 L/Cpl. Flynn J. K.O.S.B. S/7896 Cpl. Ford V.E. R.A.S.C. 5347572 Pte. Fraser E.L. R. Berks. 2737968 Gdsm. Fraser L.J.E. WelshGds. 214506 Pte. P.L. Fussell, R.A.S.C. 5111581 Pte. Goff S. Warwicks. 3969776 Pte. Grace G. Welch Rgt. 4350446 Cpl. 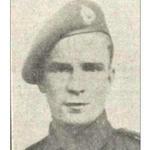 Graham G. E. Yorks. 876901 Gnr. Halmshaw A. R.A.
5186589 Sgt. Ham F. Glosters. 3861617 L/Cpl. Hampton G. Loyals. 3601406 Pte. Harris G.F. Borders. 3965370 Sgt. Heaynes L. Welch Rgt. 7010953 Rfn. Heggarty J. R.U.R. 7264010 Cpl. Henry A. R.A.M.C. 2077980 Cpl. Hinton M. R.E. 6478881 Pte. Hoodless D.S. Royal Fus. 6297771 Pte. Hooper O. Buffs. 5118341 Pte. Horne F.J. S. Staffs. 5948229 Sgt. Horne G. Beds & Herts. 889681 Bdr. Howat G. R.A.
2734873 Gdsm. Howells G.T. Welsh Guards. 5111985 Sig. Hughes C.J. R. Warwicks. 2927941 Cpl. Hughes A.H. S. Lancs. 4337783 Pte. Ibbotson J. E. Yorks. 5111228 L/Cpl. Jackson J. R. Warwicks. 915014 L/Cpl. Johnson F.C. R.A.
5110959 L/Cpl. Johnson J. R. Warwicks. 79055832 L/Cpl. Jones G.E. R.T.R. 6849921 Pte. Kealy T. J. K.R.R.C. 4694937 Pte. Keighley J. K.O.Y.L.I. 3968414 Pte. Kendall G. R. Warwicks. 5336379 Pte. Kendrick P.G. R. Berks. 5781656 Sgt Kennedy S. R. Norfolks. 20733019 Spr. Kennet K.K. R.E. 3864762 Pte. Kerr R. Loyals. 6297700 Pte. Knowles M. Buffs. 3604647 Pte. Lane J.E. Borders. 2765791 L/Cpl. Laing D. Black Watch. 5675016 Sgt. Langlands G. Somerset L.I. 3968864 Pte. Lansley F. R. Warwicks. 884501 L/Bdr. Larment H. R.A.
4546257 Pte. Leach C. W. Yorks. 3970069 Sgt. Lewis E.J. Welch Rgt. 5494647 Pte. Le Maitre W. Hampshires. 6291391 Cpl. Lilley J. Buffs. 2073383 Sgt. Lillicoe R.E. R.E. 4345289 Sgt. Lindley H. E. Yorks. 5730322 L/Cpl. Long E. Dorsets. 2733639 L/Cpl. Lloyd C.L. Welsh Guards. 2929634 Gnr. MacAulay A R.A.
5344652 L/Cpl. Mann R. R. Berks. 5435059 Pte. Martyn L.S. D.C.L.I. 4350439 Pte. Mather B. E. Yorks. 10503256 Gnr. Maund F. R.A.
5111136 Pte. May J. R. Warwicks. 3775704 L/Sgt. McCarthy F. Kings Rgt. 9426250 Gnr. McCartney J. R.A.
828757 Gnr. McCormack J. R.A.
3310783 Pte. McDermott J. H.L.I. 4390628 Gnr. McDonic J. Green Howards. 2198211 Gnr. McDonough T. R.A.
3653925 Pte. McGann S. S. Lancs. 3778700 Pte. McGlory J. Kings Rgt. 7516695 Pte. McLean J. R.A.M.C. 5341993 Pte. McLoughlin W.J. R. Berks. 3853876 Cpl. McVeigh P. Loyals. 7902963 L/Cpl. Middleton F. R.A.C. 7878047 Rsm. Morris W. R.A.C. 3771020 Pte. Mullaniff J. R.A.C. 2075499 L/Cpl. Mullen B.J. R.E. 2721240 Gdsm. Moloughney J. Irish Guards. 5123514 Cpl. Nankivell J. R. Warwicks. 805120 Gnr. Norris A. R.A.
3319042 Pte. O'Donnell R. H.L.I. 2718837 Gdsm. Orr J. Irish Guards. 5111978 Pte. Overbury T. R Warwicks. 5342934 Pte. Paget E. R. Berks. 7597121 Pte. Pardoe D. S. Staffs. 3709917 Pte. Park J. R.A.O.C. 7262386 Pte. Pasquale Jim. R.A.M.C. 7359503 Pte. Pasquale Joe. R.A.M.C. 5618281 Pte. Patey F.S. Devons. 843165 Pte. Payne W. R.A.
5110316 Pte. Price J.E.D. R. Warwicks. 947113 Gnr. Price J. R.A.
3970880 Pte. Richards N. Welch Rgt. 4469318 Pte. Richards T. Durham L.I. 7013052 Rfn. Rogers W. R.U.R. 3600232 Pte. Rudd R. Borders. 11000189 Pte. Ruskin L.J. R.A.
6850526 Rfn. Seal A. K.R.R.C. 6142679 L/Cpl. Sellars W. E. Surreys. 7386392 L/Cpl. Scanlon G. R.A.M.C. 6144649 L/Cpl. Skerry J.C. E. Surreys. 5672383 L/Cpl. Skinner B. R. Berks. T/99352 L/Cpl. Smith E.A. R.A.S.C. 3188233 Pte. Somers J. K.O.S.B. 4038517 Pte. Swinson T. K.S.L.I. 815495 Gnr. Taylor T. R.A.
6297957 Pte. Tilly S.V. Buffs. 7903221 Tpr. Thompson J. R.A.C. 5343090 Pte. Vestey J. Worcesters. 180262 L/Cpl. Vowles G. R.A.S.C. 6291393 Pte. Waddington C. Buffs. 3657617 Pte. Walker A. S. Lancs. 889072 L/Cpl. Wall D. R.A.
8835093 Cpl. Wallace J. Suffolks. 7014930 Rfn. Wallis F. R.U.R. 4346253 L/Cpl. Walsh J.W. E. Yorks. 53365587 Pte. Webb D.H. R. Berks. 5958490 Pte. Wells P. Beds & Herts. 3387224 Sgt. Wharf J. E. Lancs. 5831129 Pte. White M. Suffolks. 5338629 Pte. Whitling W. R. Berks. 60097739 Tsm. Williams C. Essex Rgt. 7903178 Cpl. Woodward L. R.A.C. 5388317 Sig. Woodyer K. Ox & Bucks L.I. 6 Officers and 44 enlisted men particpated in the raid with No. 3 and No. 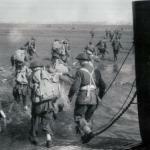 4 Commando, and the 2nd Canadian Division. 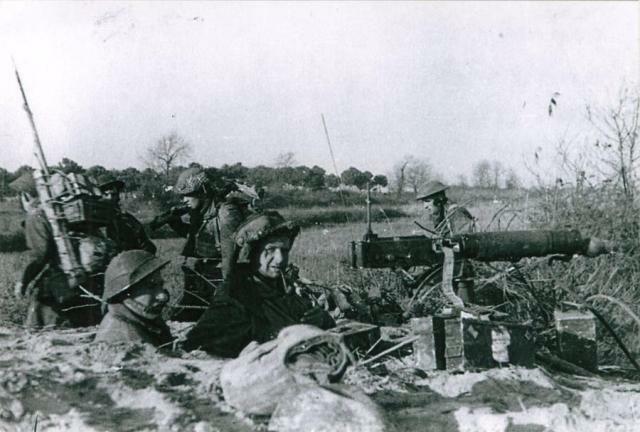 Two signallers of the South Saskatchewan Regiment were landed on Orange One Beach with No 4 Commando 'C' Troop. 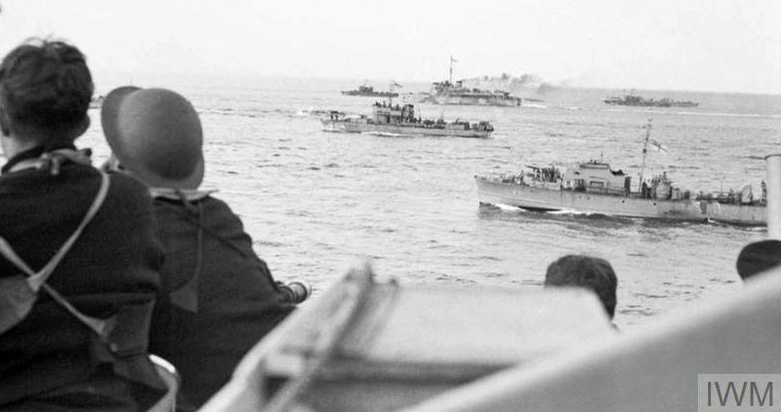 Their task was to provide a lateral link between the two units, the other unit being the Canadians who landed at 'Green Beach' Pourville. Three men from the 'Phantom' group of signallers were also at Orange Beach One. Tpr. B. Randell. The Royal Scots. Fus. C. King. The Royal Fusiliers. Military decorations for Operation Cauldron. Capt. P.A. Porteous. The Victoria Cross. Lt. Col. The Lord Lovat MC. Distinguished Service Order. Major. D Mills-Roberts. Military Cross. Capt. G.G.H. Webb. Bar to Military Cross. Capt. B.W.S. Boucher Myers. Mention in despatches. Lieut. D.C.W. Style. Military Cross. Lieut. J. Ennis. Mention in despatches. Tsm. W.R. Stockdale. Distinguished Conduct Medal. Sgt. I. Portman. Military Medal. Sgt. F McCarthy Military Medal. Cpl. G. Blunden. Military Medal. L/Cpl. R Mann. Military Medal. L/Cpl. J.C. Skerry. Mention in despatches. Tpr. W. Finney Military Medal. Gnr. T. McDonough. Military Medal. Pte. F.J. Horne. Mention in despatches. Pte. J. Dale. Mention in despatches. Pte. G. Cook. F Troop. L/Cpl. A. Diplock. A Troop. Pte. C.A. Doublair. A Troop. Sgt. G. Horne. F Troop. Gnr. G.H. Inverson. B Troop. Pte. W. Rogers. A Troop. L/Cpl. G. Vowles. F Troop. nb. The above does not contain those from No 3 Commando and 40RM Commando as no such list of names has been found.